we are headed back to brawley after a stay at the slabs. got to visit with tom and charlene and bob. bob and i took two hikes in the desert with the dogs, and mutt leapt with joy at his freedom, and the chance to hang out with his buddy homer. 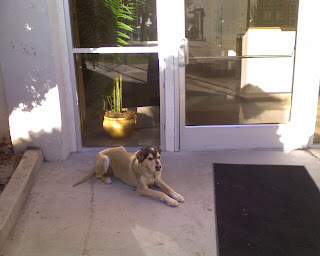 he also got to trade sniffs with Sheriff Victoria and Squirrel, but Bus Dingo was no where to be found. he is passed out on the bed in the rondyvan now, luxuriating in the relaxation a good romp in the desert can bring, and twitching with jackrabbit dreams. i happened upon a pair of footwear in the desert, abandoned in the midst of an untold story. can you guess which pair is mine? on monday one of the extended family had an accident, and I drove them to san diego to see a specialist. On that trip I discovered I needed a brake job. 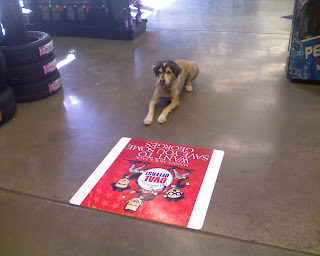 Here is mutt at the Pep Boys in El Centro.....you guessed it.....waiting. 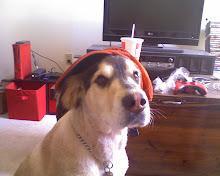 Mutt needs a day off from the sometimes stressful job of being a loyal companion, and is going to the slabs for a day of being a carefree dog with his buddy Homer, and maybe trade some sniffing with Squirrel, Bus Dingo, and Sheriff Victoria. I haven't blogged for awhile. 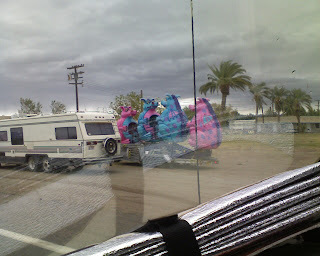 We are all in Brawley, Ca, south of slab city where we have been camping in the desert. 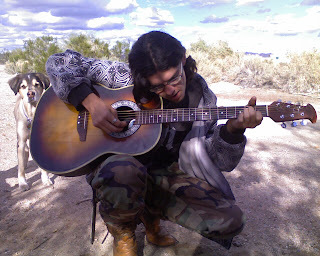 I met up with mike and heidi (of "love is blind") and several other vandwellers at the slabs and will have several posts about slab city and our adventures. last friday, though, sweet mike was admitted to the hospital in brawley with a serious case of pneumonia. We very nearly lost him, and he is still in ICU as of this morning. We are hoping for a transfer to a regular room on a med-surg floor in the near future. Needless to say, it has been a stressful week.there has been fear, and a lot of tears. But there has also been a lot of laughter and courage, and the reminder that love thrives, even in the darkest places. sometimes in our human dramas, we can forget our silent companions, who wait faithfully in the wings......a lesson in acceptance and living in the moment. Mutt understands the least of where we are and why we are here, but accepts implicitly that we are not waiting for life to begin again, after this is over.......but that this is our life, our moment here and now.....the waiting. and if biscuits and fetch and walks are fewer and farther between he is absolutely okay with that because life is what it is, regardless of what it gives you, and that alone is enough. 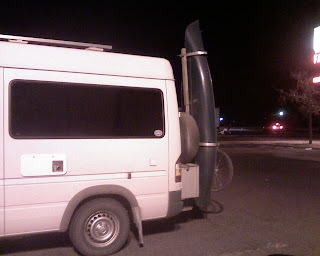 last week, I posted a picture of a sprinter van with an unusual kayak rack that I parked next to in a truckstop in texas. I only got 1 photo that night, and was disappointed when the van drove off early in the morning before I could get more photos. 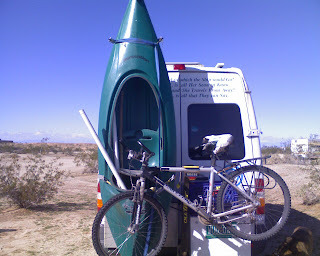 a couple days ago, I returned to the slabs from a trip to town, and there smack dab in the middle of camp was the sprinter van with the green kayak attached. you'd think I would cease to be surprised at the funky happenings in my life. but I was pretty blown away. the guy remembered me by the "hilltopmusicstore.com" sticker on the side of my van. oh, and yeah, the orange kayak, too! I think we convinced reed to join vandwellers, and hope we'll be hooking up with him down the road. while here at the slabs, i was fortunate to benefit from the skills and knowledge of bob wells, fellow vandweller and owner of cheaperRVliving.com. If you click on the title of this post, it will take you there. bob has posted a more indepth article about how he did the build. this is the frame of the bed, which he sized to fit my drawers stacked 2 high. this automatically doubles my storage space. this is the frame before he added the shelving behind the drivers seat. this is the completed shelving unit. i finally have a space for my 2 gal. igloo water jug, so i don't have to haul it out from under the cot and hold it in the air while i fill my nalgene. the jug holds 1 bag of ice and 1 gallon of water and keeps it cold for days. this is the pull-out shelf for my butane stove. this alone has revolutionized vandwelling for me. with easy access to stove and water, making soup or ramen or tea is effortless. see the 2 spray bottles hanging on the bungee? one is water and one is 50/50 water and dr. bronners peppermint soap. i use these for easy clean-up of dishes, or face and hands, using paper towels. another view of the underbed storage drawers. the small action-packer is a great little table, footstool or extra seat. i store extra food in there. another rear shot, showing a little curtain on a rod that hides the portapottie. home sweet home! thank-you, Bob, from the bottom of my heart. life is so much easier in my new set-up. you have my undying devotion! Impromptu jam at the slabs! on our first day at the slabs, people stopped by our camp to welcome us to the neighborhood. 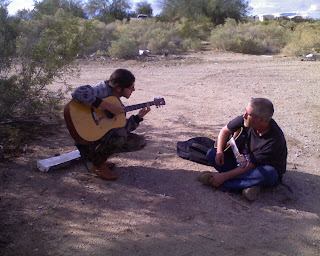 some of the first were alan and tony, who strolled into camp with guitars over their shoulders, like legends of the desert. they chatted a bit, then treated us to an impromptu jam. 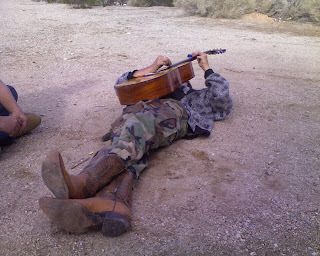 after awhile, alan lay down in the desert and played slide guitar with a stolen cigarette lighter. what do you think, charlene? last night, I hung out with mike and heidi in roadie for awhile. In the middle of a sentence, a song popped into my head that I hadn't played in decades. I began to sing those verses that I could remember, which involved a lot of "lala" and "m-m" because you know how I am with lyrics. the conversation turned to music and guitars, and mike pulled down a now songbook he just got, flipped it open and started to explain guitar tabs to me. I listened for a minute, then stopped him and said "too weird!". 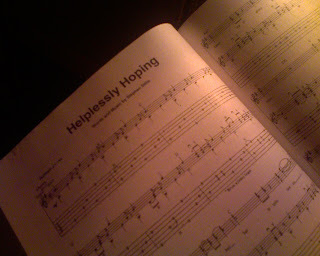 He had flipped open a 1,200 page book to the page containing "helplessly hoping", the song I had just been singing a few minutes before! Even Bocephus Vanmonkey got goosebumps! 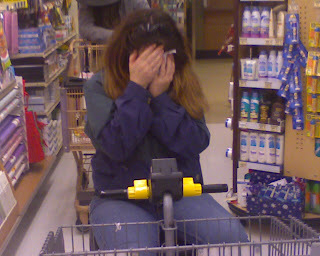 this is a pic of heidi riding the electric whheelchair at the Von's supermarket after falling in a hole at the dump station. I think we're lucky she didn't fall in the sewer hole. I'm no better. I fell off the van roof on saturday while trying to secure my kayak-turned-windsock on a desolate stretch of I-8. I have felt better, and groan a lot when I move. You'll note there are no pictures of that. To top it off, mutt is accusing bocephus of stealing the steak in the doggie bag off the dashboard. I was following heidi and mike into niland today. As we approached the intersection of main st and hwy 111, a tractor trailer full of monsters passed us going north. 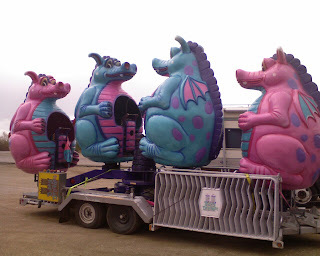 Mike turns north and drove past the now-pulled-over tractor trailer of monsters, which I very clearly see (see photo). Mike drives a short way, pulls over, and I pull alongside him. "we'll head back the way we came" he says. "good! " I reply. " I want to get a better picture of the monsters"
they both look puzzled. "monsters?" mike says, with a glance at heidi. "monsters" I reply with a laugh. "on that tractor trailer. Are you guys blind?" heidi chuckles, after glancing knowingly at mike. I have not been feeling well, and obviously have a fever to go with my ear infection....."maybe we're not blind, but someones delirious" she laughs. i spent the night in a truckstop in dallas texas, despite moans and groans from the wizard about the stupidity of the idea. there was a heavy police presence there, though, and the night was uneventful, if you discount the fact that they had outdoor speakers that blasted hiphop all night long. things got more exciting the next day, though. don't be shocked, i am not kidding you. the car that had been parked by us all night long had caught fire, and i found a use for the extra gallons of water i had been tripping over since san antonio. here is the guy putting out his carpeting. when he lifted the floor mat, you could see pavement :-( this was not a good thing, cause he had just sold the car....his only home....because he needed the money, and some guy was on his way to get it. the first thing we did was the "i'll show you mine if you show me yours" shuffle. her van is very cool. then again, every van i meet has some unique quality that makes it stand out. such is the nature of the creativity of vandwellers. but vickie had come up with solutions to problems that were very unique and may be the solution to some of my issues. first of all, were the clips. remember the clips? she had an actual box of clips, neatly labeled and tucked away in one of her totes. her totes are lined up against one side of her van, neatly wedged behind the rear captains chair. on top were cushions covered in gray vinyl that matched the interior of the van....it made the interior seem even bigger, and very soothing to be in. she could rearrange the cushions and the totes in different ways, depending on her needs. i know she had explained this on vandwellers, but it was much cooler than i had envisioned it. the very best part was the fact that each of these cushions fit into the window wells in the back of the van, making creative use of that space when she needed the cushions out of the way. but it wasn't just van stuff i learned from vickie. 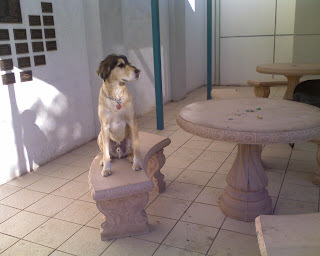 she took mutt and i to a nearby park, where we walked and talked and got to know each other. i learned some things about myself in our conversation; validation about some decisions i had made in my life some time ago that i needed to hear. the universe just gives me gifts like this when i least expect it, and usually through the most delightful people. thank-you, vickie. who obviously knows where mutt's tongue has been last and reacts accordingly. but when she is not forthcoming, goes back to devin, full of remorse. it was alot of fun, and vickie ran into a couple people she knew, and all too soon, it was time to go. one other special memory for me will be when vickie's daughter sang me one of the songs she wrote. i began crying before i even heard the words, her voice was that beautiful. thank-you melanie. i look forward to the cd. i spent the night in the same truckstop, because i had hoped to doctor the burns on royce's hands again, and check the extent of the blistering on the palm. he didn't have medical insurance, but vickie told me where he could get care. but royce and the car were both gone. i hope he is safe and warm, wherever he is. the next day i finally found the grave of stevie ray vaughan. i am not one big on monuments or memorials other than the ones in our hearts, but i was strangely moved by the first sight of the grave. he was not only my favorite guitarist, but a brother in recovery. the grave was recently visited by los lonely boys, or a big fan of theirs. i hadn't planned on leaving anything, but was moved to leave a bead (see inside the "o"). 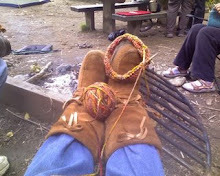 at the eastern primitive rendezvous, we used to have AA meetings at gator's tent ( or any of the many tents with the sign of the triangle) and we used to get a trade bead, kinda like the 18th century's answer to the chip. i had a small medicine bag of them, and decided to leave one for stevie. i think he mighta liked it. then we got the hell outta dallas. and issue #1 of the first ever knitting comic book, Handknit heroes! what a hoot! sweet mike will love it! he can now have his comics, and knit it, too! finally, on friday, my first texas barbeque. we caravanned to lanno, texas where ron spoiled me with the best barbeque in texas. i could believe it. the pits are amazing, and the smell is heavenly. i've talked about my mechanic gary, and his wife cathy before. i went to school with both of them, back in the day. we've been friends forever, and they have always kept me in a vehicle, sometimes against all odds, despite my inherent inability to describe sounds, smells and behaviors of my vehicle with any accuracy (right, david h?). so the cool/sad thing is that over the last year or so, cathy and i have gotten very close. cool because she was a big support to me during my cancer stuff, and i was honored to help her out during some recent surgeries. she also has new twin grandbabies that she shares very generously, thereby satisfying my ongoing need for babies to snuggle and love and smooch. the sad part is, when i am on the road, i miss her something fierce. but not her bread. you see, cathy is about the best cook i know. i am not kidding. and bakes? oh, can she ever bake. cakes and cookies and (so she says) bread, oh my. at christmas, her daughter ange brought the babies to cathy's house for the annual cookie baking day, which just happened to be 3 days after cathy's most recent surgery. i got invited so i could help out with the babies, and because they love me, of course :-) in exchange, i got dozens of the best christmas cookies ever. a couple weeks later, i went down to help cathy babysit again, and was excited about the fresh bread she was making to go with the stew. but as i peered expectantly into the bread machine window, i became alarmed at what i saw. cathy said "it must be the yeast" and dumped the lump into the trash. she started a new batch, but my alarm became fear when i again looked into the bread machine. cathy said " give it time, it it just needs time". well, i made it my mission to stand guard over the bread machine.....you've seen those movies where the tomatoes eat california, or something?....but i regretted not having a gun with me. but not to worry. this lump wasn't getting big enough to be eaten, let alone eat us. the stew was good, though, as was the bread bought at the local mini market. but the best part? all the fun and love and laughs we shared. i really miss them! on my way to austin texas last week, ron routed me north of houston to avoid the traffic. on the way i passed through a town called "cut and shoot". now, if ever there was a town i'd wanna live in just so i could say i lived there, it would be cut and shoot. pastor jessie prewitt was just pulling out of the parking lot. he turned around and came back to introduce himself, and gave me a tour of the church. that's jessie at his pulpit, and he is evidence of the kind and big hearted texans you hear so much about. the open range cowboy church is a perfect place for folks who are uncomfortable in houses of worship that place too much emphasis on what you are wearing than on the condition of your heart. you can get baptized in a horse trough! how cool is that! i lost the picture of the chuckwagon area, where they gather for coffee and donuts and such after services. they also have potlucks and cowboy breakfasts and extreme cowboy races in the fenced in area....people bring their horses to church and have (for lack of a better term, help me here jessie) mini rodeos! at the extreme race in january, they had cowboy breakfast, music, an old timey wild west shootout, a little buckaroos stick horse race, and the big buckaroos extreme cowboy race.